His work responds to the widespread conflicts around the world, from the refugee crisis in Sub-Saharan Africa to China’s questioning interest in Africa now. 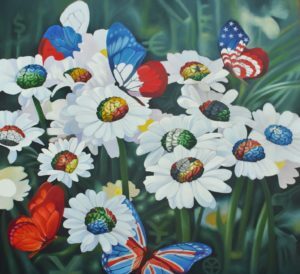 With oil on canvas, he weaves together narratives that invite conversations on the political-social tragedies happening across the world today. 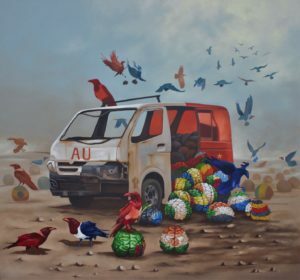 Also witty and dream-like, Ssekubulwa’s compositions are skillfully executed putting him in the prestigious class of figurative Ugandan painters which include Paul Ndema, Mzili, Arim Andrew and Ian Mwesiga. 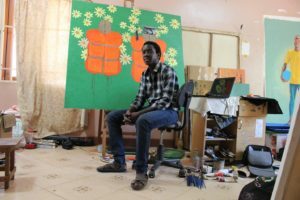 I met him at his studio in Kireka, a Kampala suburb, in a space he shares with two other artist friends, Ocom Adonias and Arim Andrew. We went on a journey to discover what lies beneath his provocative compositions, his ideas, philosophy and you guessed it, we couldn’t avoid the notorious isms. JBS: Thanks Matt. Hope you enjoyed the show. MK: I loved it. When I stepped in the gallery at the opening, I knew this was it! So how long have you been working on this body of work? JBS: Well I started working and planning this show towards the end of 2017 till February of 2019, to be precise, it took me 15 months and 3 weeks, and on average I spent about a month on each work. Some obviously took longer than a month considering the different sizes, content, material among other factors. MK: How does your process of creating look like? JBS: (Laughs)…. Good question, most of the work in this exhibition is a personal gaze about affairs around me(Africa) and the rest of the world. I should say most of the works start in my mind. That’s where I organize them before creating sketches for them. 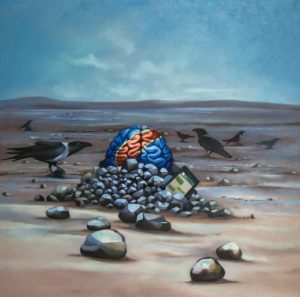 I also pay a lot of attention to the objects around me and how I relate with them while thinking about these things because I believe they come in handy when it comes to relaying information, and they spark so many thoughts when juxtaposed with the brains. For example the scare crow. We grew up building them to protect our maize fields from pests of all kind. The fact that I had this in mind it was very well fitting to use it to talk about the things that are happening on my continent which has fallen prey our almost effortless need to defend our fields(resources). There after I come up with a sketch to organize the work, plan all the aspects that consolidate its aesthetics, like color, light etc. all in unison with what the picture is communicating. MK: So “Brain Damage”, how did this come to be the title of the show? JBS: I put together words that were eminent in the exhibition statement, what the work was questioning and, boom, Brain damage was the right word. 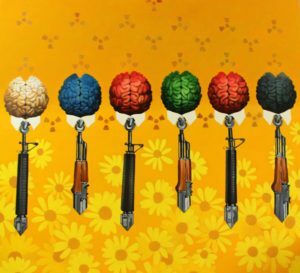 Considering using the brain as a recurring motif in all the pictures, hah, sometimes you feel the system has done a lot of damage to your brain. I don’t know how much control we have though. JBS: Capitalism. Marxists define capital as a social, economic relation between people (rather than between people and things). I think the system needs to be rethought as it would eventually stagnate due to internal contradictions and be followed by socialism. Just like Karl Marx saw. MK: So I guess you are anti-capitalist. JBS: Yes, it works for a few and leaves out the many, the 1%. MK: So what model do you think would be ideal for Africa? JBS: The model that used to work for Africa before, just a few changes need to be made. MK: Would you call yourself a Pan Africanist? JBS: I admire Pan Africanists, I like to be like them. MK: Somewhere in your exhibition statement, it says you were brought up in a morally upright family with strong values. How has this fed back into your work? JBS: (Laughs ) oh my…well, when I was creating and planning this body of work, questions that evolve around humanity, which includes our morals in politics, economics and other aspects of life have been selfishly and unselfishly preserved. And how they dictate time for humanity is also important. Most times I thought of it, the song ‘Heal the world’, from the king of pop came up. It speaks volumes on our world today. 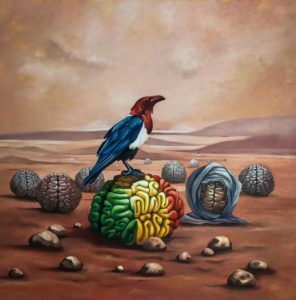 MK: Looking at your work, I see some symbolism, most evidently the image of a human brain which appears in every painting. What does it, the crow and the flowers stand for? JBS: For me the human brain is the master of all faculties of human anatomy. I present it in a rather vulnerable position since its standing in solitude without other parts that complete our anatomy. For me this is how my world feels today, division is bliss, we can’t seem to work together, we are dancing to the tunes of the systems, the crow is a bird of prey, trick star, and said to have a clairvoyance, the flowers are a symbol of hope and new beginnings. MK: I also notice you don’t have any human figures in your work which is interesting because your work speaks about human experiences but you choose to omit them. JBS : Yes in most cases we are so taken up by our presence and forget our surroundings. I believe we play great role in telling time depending on how we use them, it also helps to relate more deeply with the objects we use and the validity of our decision to deploy them. We can use them against ourselves and the things that surround us, hence there’s more to being a being. MK: Tell me more about time, you keep mentioning it. JBS: Time keeps recurring because the consequences of our actions greatly influence our time. Wars, ideologies, power, politics, among others, all have a great influence. MK: You seem to research a lot and stay up to date with current affairs globally. How do you get to this information? JBS: I get most of my information from, headlines in the news, documentaries about historical events which help me relate and understand the present situation, books, news journals and from engaging in talks to seniors and my contemporaries in particular fields of my interest. MK: What are you reading currently? JBS: Churchill and the Mad Mullah of Somaliland. MK: What do you want to achieve with this body of work? JBS: Wow… phheww, my greatest achievement in this body of work will be, the work being able to project my views, not just staying on walls but seeing some of these ideas being propagated in our ways of life, especially those that carry a strong message of nationalism and humanism. MK: Who are the artists, local and outside Africa that have inspired you? JBS: Locally I admire Henry Mzili Mujunga, Xenson, Paul Ndema, Bannada Godfrey list is endless but those are the key artists, internationally I like El Anatsui, Chiharu Shiota, Cheri Samba, Pascale Martine Tayou, Aidah Muluneh, Njideka Akunyili Crosby. ← Is black art just a trend?